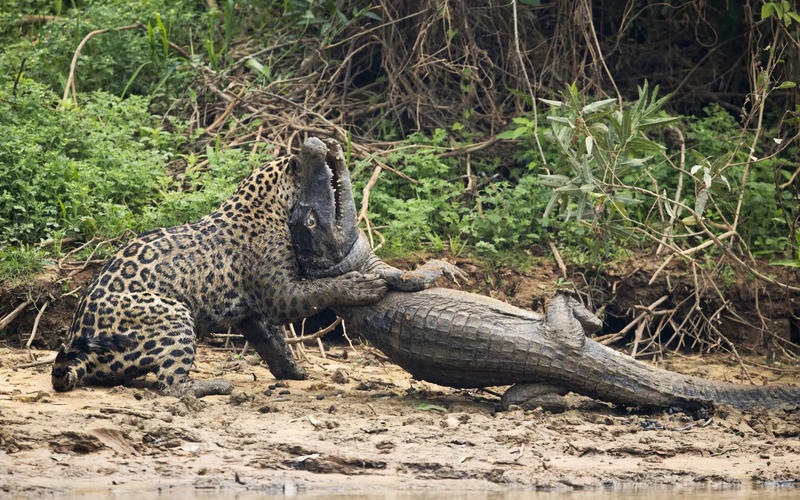 A wildlife photographer has captured the savage moment a jaguar pounced and then tussled a caiman to death in Brazil. 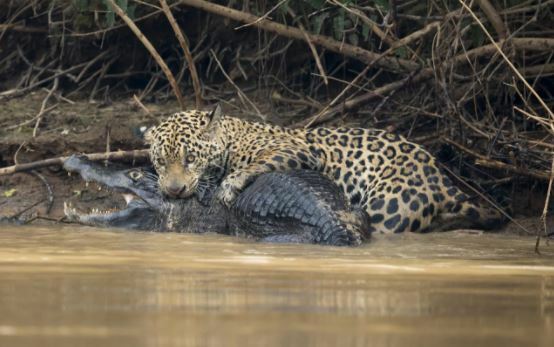 Chris Brunskill snapped the scrap on the banks of the Three Brothers River in the Pantanal area of the state of Mato Grosso. After hearing reports of a jaguar seen nearby, Brunskill – ever the opportunist – hurried to the area. He knew there to be a giant jacare caiman, a member of the Alligatoridae family, swimming near the banks. After finding the animal he then proceeded to watch the young female jaguar for a whole hour and at one point, she unsuccessfully went for a small gang of capybara. It was then she set hers eyes, (and paws), on the unsuspecting caiman. Moments later she was walking through an open stretch of water when she pounced on the biggest jacare caiman I have ever seen during all my time on the river in Pantanal. After a long struggle, she immobilised the giant reptile with the trademark jaguar bite to the back of the skull, and then dragged the huge carcass for over twenty minutes across an open beach into thick cover. Good God, it doesn’t bear thinking about. 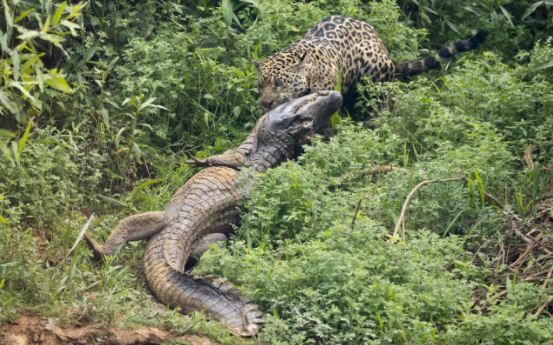 Caimans, unfortunately, are a big part of the jaguar’s diet in the Pantanal. However, wrestles between the two like Brunskill saw are seldom seem by human eyes. Animal lovers recently lashed out after footage emerged of a caiman being fed cats and dogs for entertainment. 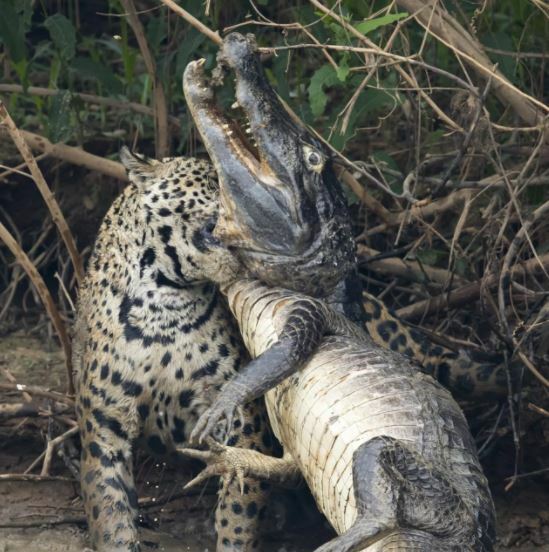 An eyewitness filmed the caiman devouring an innocent moggy near the town of Puerto Berrio in north-Western Colombia’s department of Antioquia. Spectators can be seen whooping and hollering as the cat comes to the end of its presumably ninth and final life. ‘Look, it’s great!’ one girl bellows, while others around her applause in amazement. Animal activist Nancy Monterrosa said locals were complaining that their cats and dogs were being stolen and fed to the caiman. The video sent to me by a person who is very sad as he lost his pet and supects that it was food for the caiman living there. There are several caiman in the area. The situation is out of control and nobody is doing anything about it. People told me that fishermen have offered to catch them and to take them away to a better place but we do not know what the authorities have said. 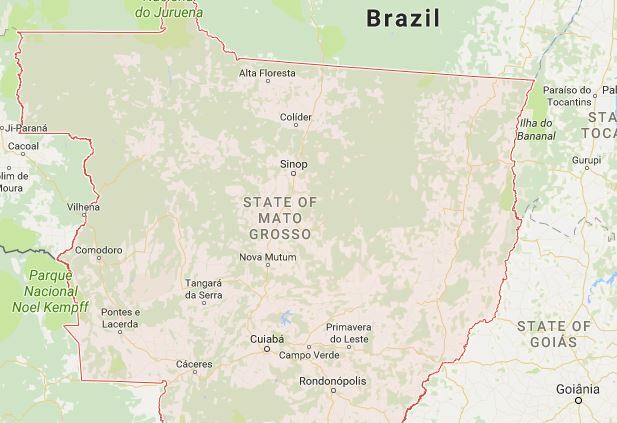 Secretary of the local environment department, Cesar Augusto Lascarro, said however that experts have visited the area once before to investigate the claims. They visited the area and we hope that in the following days, biologists will arrive there to take it to the Chiqueros area which is its natural habitat. We know that it is new and interesting people but throwing it food and other things is dangerous. Lascarro said that as long as people feed the caiman it will not try to leave the lake.